This article discusses conceptualizing and actualizing technology for music learning. While approaches to using technology in education have often been technocentric, music teachers must not only consider technology itself, but also curricular outcomes, pedagogy, and the teaching/learning context when designing learning experiences for students. The extent to which technology may be utilized can vary on a continuum from slight enhancement to complete transformation of the learning experience. Three recent and potentially transforming approaches to music learning that are made possible through technology are described. It is important for music educators to consider the ramifications of new and developing technologies on creating, performing, listening to, and learning about music. Through current and emerging technologies, people of all ages and from all walks of life may be able to engage in meaningful musical experiences throughout their lives. Historically, music education in the United States has been consistently linked to and influenced by the country’s sociological and cultural trends, as well as general educational policies and initiatives. From the itinerant teachers who traveled from town to town in the 18th and 19th centuries to help improve the singing deficiencies of church congregations, to the development of school band programs modeled on the great professional ensembles of Patrick Gilmore and John Philip Sousa, to the introduction of multicultural musics to school curricula during the civil rights movement of the 1960s, music education has not only reflected the world around us but also served to further societal goals (Mark & Madura, 2014). Today our lives are increasingly intertwined with digital technologies, with technological sophistication viewed as an important element of a healthy economy. As in the past, this societal focus is also reflected in contemporary educational dialog and practices. Technological literacy for students is a prime concern of the U.S. Government (U. S. Department of Education, 2010), organizations that focus on school reform emphasize the importance of technology to ensure students will have the knowledge and skills necessary for successful lives (Partnership for 21st Century Skills, 2013), and national standards in technology for students, teachers, and administrators have been developed (International Society for Technology in Education, 2013). The impact of technology on all types of learning, both formal and informal, inside and outside of school, has been profound and continues to grow. Musicians too have embraced modern technologies. Technology is an integral aspect of how many forms of music, particularly popular musics, are created, performed, recorded, produced, disseminated, and listened to. Likewise, progressive music teachers and researchers have explored numerous ways to apply technological innovations to music learning (e.g., Dunphy & Pinchock, 1997; Rudolph, 2004; Watson, 2011; Webster, 2011; Williams & Webster, 2006). Yet despite the efforts of these individuals and technology’s prominence in educational discussions, researchers have found that, in general, music educators don’t extensively utilize technology directly with students to facilitate learning outcomes (Dorfman, 2008; Jassmann, 2004; Ohlenbusch, 2001; Reese & Rimington, 2000; Taylor & Deal, 2000). They do frequently employ it to assist with the administrative aspects of teaching music. Traditional music classes and ensembles, and instructional practices that have been in use for decades, are prominent in most school music situations. While there is evidence that new, technology-based approaches may be increasing in some areas of music education (Williams, 2012), it appears many music educators are not actively utilizing technology in a manner that could potentially facilitate and enhance musical experiences for students. Technocentrism refers to the tendency to give a …centrality to a technical object – for example computers or Logo … (this) betray(s) a tendency to reduce what are really the most important components of educational situations – people and cultures – to a secondary, facilitating role. The context of human development is always a culture, never an isolated technology… (Solomon, 1987, p.128). Technology is a tool, and while it is necessary for teachers to have an understanding of various technological tools, such knowledge is not in itself sufficient. Teaching and learning are dynamic processes that involve numerous factors. When it comes to effectively using technology, the combination and interaction of all constituent elements has not always been fully considered. The contextual nature of classrooms and rehearsals do not lend themselves to easy recipes that will guarantee successful learning, with or without technology. The art and science of teaching by skilled educators involves making ‘real time’ instructional decisions, adjusting on the fly. The use of any teaching tool, including technology, requires the ability to consider that tool in light of students, learning outcomes, pedagogy, the classroom environment, and the tool itself. Building on the work of Lee Schulman (1986), Michigan State University professors Punya Mishra and Matthew Koehler developed a model of technology integration that accounts for the dynamic relationship among many factors that are part of any learning situation (Kohler &; Mishra, 2008). According to Shulman, all teachers need to have a deep understanding of their disciplinary content (content knowledge – CK), the subject matter that they teach. In addition, there are aspects of pedagogy – the how to teach component of teacher knowledge – that all educators have in common (pedagogical knowledge – PK). For example, every teacher needs to understand child development, principles of student motivation, assessment concepts, and so on. However, when a teacher’s content and pedagogical knowledge intersect, they interact in ways that are unique to each teaching discipline, with both content knowledge and pedagogical knowledge influencing each other. Shulman calls this intersection pedagogical content knowledge (PCK). For instance, subject matter and pedagogy can affect each other in ways that may result in an English, math, physical education, and music teacher scaffolding learning for students in quite different ways. Previous approaches to helping teachers learn to take advantage of technology have focused on teaching teachers about technology. We believed (erroneously, as the research increasingly indicates) that after teachers learned to use technology, they would naturally figure out how to use the technology to teach their content area. What is clear now is that we need to go beyond simplistic technocentric approaches because knowledge of technology does not necessarily lead to effective teaching with technology. Effective use of technology, we have learned, involves the ability to make informed decisions on how to take advantage of the affordances of technology (with a sensitivity to the concomitant constraints technologies bring to the table) to support specific pedagogies within a particular content area. Thus, teachers need the total PACKage: the knowledge that lies at the intersection of knowledge of Content, Pedagogy AND Technology i.e., TPACK. (Thompson & Mishra, 2007-2008, p. 38). If technology is to be a useful tool for teaching and learning, it seems logical that teachers need not only well-developed pedagogical content knowledge, but that they also have to have an understanding of technology itself and how it interacts with PCK. The TPACK model provides a way to conceptualize and actualize how technology can be effectively integrated into teaching and learning. Importantly, in this model technology is conceptualized as a tool to be used to further curricular goals rather than as an end in itself. The TPACK model is applicable to music education (see Bauer, 2013 & Bauer, 2014). The following brief overview of the model is provided to further delineate its parts and provide an example of its utility as a framework to think about the use of technology in music teaching and learning. The primary components of the TPACK model are (a) content knowledge (CK), (b) pedagogical knowledge (PK), and (c) technology knowledge (TK). The three musical processes of creating (improvisation, composition, and other creative endeavors), performing (singing &; playing instruments), and responding (knowledge of/about music; music listening) to music are frequently used to conceptualize comprehensive musical content knowledge. For example, both the original national music standards (Music Educators National Conference, 1994a) and the revised version (National Coalition for Core Arts Standards, 2013) are organized around these three types of musicking. All music teachers need to have content knowledge and skill relevant to these aspects of musicianship. Pedagogical knowledge, discussed previously, includes general principles of teaching that are common among all educational disciplines. Technology knowledge involves having a general technological literacy, with the ability to accomplish standard activities such as operating a computer and understanding how to use common software tools such as word processors, spreadsheets, web browsers, etc. that are common in our modern society. Like pedagogical knowledge, all teachers, regardless of discipline, need similar general technological understandings. While all three of these primary forms of knowledge evolve over time necessitating ongoing learning for teachers, the fast pace of technological change can make it an especially challenging area in which to stay fluent. The model (see Figure 1) becomes particularly interesting when considering the ways in which these primary forms of knowledge intersect and dynamically interact with each other. As previously described, pedagogical content knowledge is unique for each teaching discipline, reflecting the influence of a specific subject matter knowledge on standard pedagogies, and vice versa. Technological content knowledge (TK) is an understanding of how technology is used by a content area in the world at large, as well as how the content area may be impacted by the technology. For instance, the Internet, hardware devices such as iPods and smartphones, and music services like iTunes, Google Play, and Spotify have transformed the way many people locate, acquire, and listen to music. Technological pedagogical knowledge (TPK) is the combination and interaction of technology knowledge and pedagogical knowledge and references teachers’ understanding of how to use common technologies for teaching and learning across subject matter disciplines. Here, an example might include knowledge of the principles of using an interactive whiteboard to engage an entire classroom of students in active learning experiences. 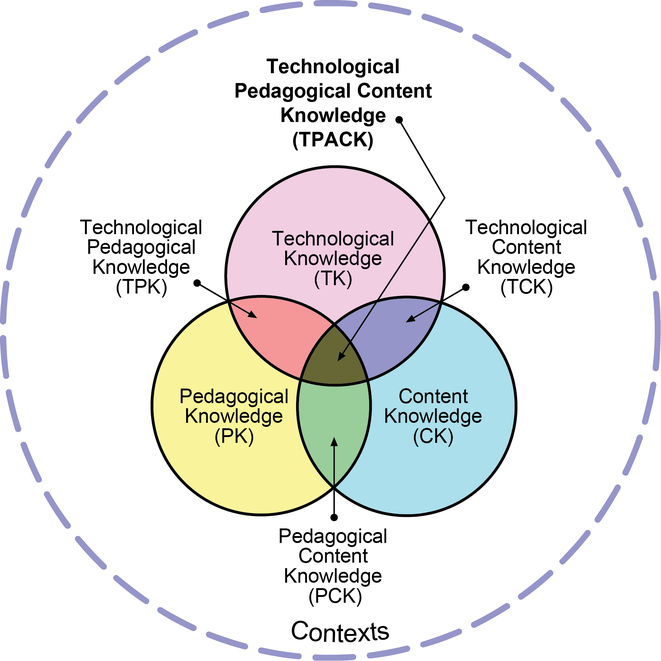 At the intersection of content, pedagogical, and technology knowledge is technological pedagogical and content knowledge (TPACK), the center of Figure 1. While technological, pedagogical, and content knowledge are each necessary as discrete components of teacher understanding, it is the transactional influence they have on one another that potentially affects an educator’s choices regarding the use of specific technologies and pedagogies, and even the specific content to be taught. In addition, the context of any learning environment is also recognized as a factor to consider. The National Association for Music Education (NAfME) would consider context to include opportunity-to-learn issues such as curriculum and scheduling, staffing, materials and equipment, and facilities (Music Educators National Conference, 1994b). The general level of interest in and support for the use of technology by administrators, instructional technology support personnel, and the degree of use of technology by other teachers within a school would also contribute to a teaching/learning context. By utilizing the TPACK model, teachers who have an understanding of the specific content and pedagogical needs for a subject can then examine the affordances (benefits) and constraints (limiting features) of any particular technology, making appropriate decisions as to how to utilize the technology, if at all. The TPACK framework has the potential to take the focus off of technology itself and place it on ways in which technology might assist students in achieving curricular goals. …captures what is most essential about the structure of a particular kind of learning action as it relates to what students do when engaged in that particular learning-related activity (e.g., “group discussion;” “role play;” “field trip”). Activity types are combined to create lesson plans, projects and units (Harris & Hofer, 2009, p. 3). Grounded in the research and pedagogical literature in music education, the Music Learning Activity Types (Bauer, Harris, & Hofer, 2012; Bauer, Hofer, & Harris, J., 2012), are organized around the musical processes of creating, performing, and responding to music. Their purpose is to help music teachers align curricular outcomes, pedagogy, and technology. Table 1 provides an example of the Music Learning Activity Types. The complete Music Learning Activity Types can be downloaded for free from http://activitytypes.wmwikis.net/Music. The SAMR approach to technology integration (Puentedura, 2008) is another way of thinking about how technology may be used for music teaching and learning. SAMR is an acronym for substitution, augmentation, modification, and redefinition. While an independent model, it fits within the TPACK conceptual framework. SAMR is a progressive system that conceptualizes increasingly sophisticated utilization of technology. The basic premise of the model is that as the use of technology moves along the continuum from substitution to redefinition, its potential impact on student learning increases. Figure 2 is a visual representation of the SAMR model. 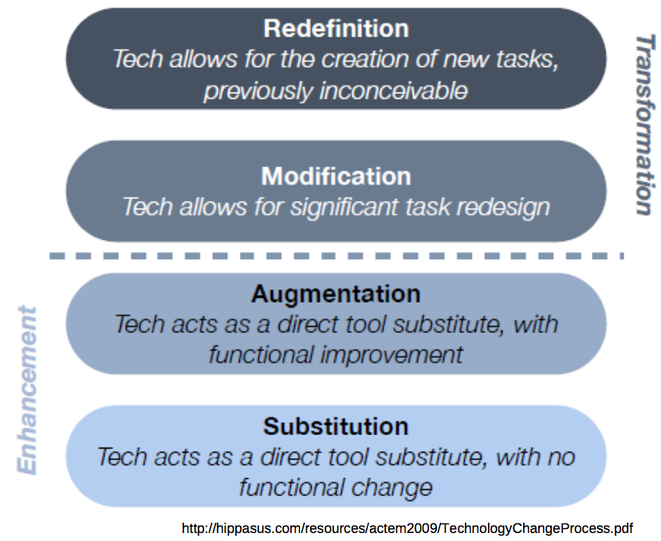 At the substitution level of the SAMR model, modern technology is used as a direct substitute for an older tool or approach to doing something. For example, a common technology that has been traditionally used to help students develop rhythmic abilities is a metronome. If a teacher used a metronome app on a smartphone during a class or rehearsal instead of an older, analog metronome, this would be substitution. The metronome app provides the same basic functionality, establishing and maintaining a given tempo, as the old metronome did. It is merely a substitute for the older metronome. Technology used at the level of augmentation substitutes for an older tool, but also adds additional functionality that wasn’t previously available. For instance, the smartphone metronome app might include the ability to provide tempos and subdivisions in a variety of meters, and allow for a variety of timbres to be used as metronome sounds. In addition, because it can be obtained at low or no cost, and is easily accessible via a personal phone or other device such as an iPod touch, students may be able to have their own, personal metronome that is always with them, available to be used as needed. When utilized appropriately, these attributes of the metronome app can augment the learning process. The modification level of technology use allows for a learning task to be completely redesigned. To continue the discussion of using technology as a tool to develop students’ rhythmic abilities, consider how using SmartMusic might change the approach used for rhythmic development. In SmartMusic, students not only have available the aural click of a metronome to stay in tempo, they can also play along to actual musical accompaniments to practice performing in tempo with precision. In addition, for some tunes and exercises, SmartMusic will provide visual feedback regarding rhythmic accuracy. These technological affordances allow for a very different approach to be utilized for learning to play accurate rhythms within a given tempo. The learning task can be significantly modified. When technology is used for redefinition, it allows for engagement in new tasks that weren’t previously possible. While SmartMusic can be used to modify the process of learning rhythm, it can also redefine it. In addition to the attributes previously describe, SmartMusic accompaniments will follow a performer, speeding up and slowing down as the performer does. This feature allows students to experiment with accelerando, ritardando, and rubato, advanced rhythmic concepts that are used in authentic musical performances. In doing so, students engage in the type of thinking that is required for refined musicianship. In addition, through SmartMusic’s recording capabilities, students can record themselves, play back the recording to self-assess rhythm and other aspects of performance, and upload a copy of the recording to their teacher’s virtual classroom for formal or informal feedback. These features of SmartMusic redefine how students can develop basic and advanced rhythmic understanding and ability. The substitution and augmentation levels are collectively seen as enhancements to teaching and learning, while the modification and redefinition levels are capable of transforming the learning process (see Figure 2). However, using technology in any of these ways may be valuable within a given context. SAMR can be combined with TPACK by considering the increasingly sophisticated applications of technology when choosing pedagogies and technologies to facilitate the acquisition of curricular outcomes. When designing learning experiences, music educators can ask themselves how they might utilize technology to enhance or transform students’ acquisition of cognitive knowledge and psychomotor skills, as well as their affective response to music. Note. In this video Ruben Puentedura, the creator of the SAMR model explains three technology integration models, including SAMR. Most in-service music teachers indicate that their pre-service music education program did not fully prepare them to integrate technology into student learning experiences. In a recent study that investigated applications of TPACK to music teachers’ knowledge of technology integration (Bauer, 2013), in-service music educators rated their technology knowledge as the weakest aspect of the TPACK triad of content, pedagogical, and technology knowledge. While participants indicated they were adequately prepared as undergraduates in content and pedagogical knowledge, development of technology knowledge was insufficient, let alone consideration of the influences of the three areas on each other. The primary way the teachers reported acquiring three (TCK, TPK, and TPACK) of the four TPACK domains that include technology was through self-exploration. This was also the second highest rated approach for the fourth domain that includes technology, TK. Other important means of acquiring TPACK competencies reported by the participants included music education conferences and summer workshops. This points out the importance of quality professional development experiences related to music learning and technology in these venues. 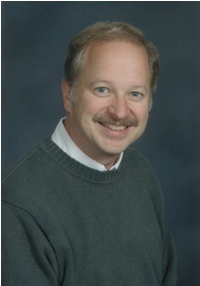 For pre-service teachers to be prepared to meaningfully utilize technology with their students, they not only need the opportunity to develop the discrete elements of TPACK, but also must be asked to consider how outcomes, pedagogy, and technology interact and influence each other within given learning contexts. Some ways this can be facilitated include (a) engaging pre-service teachers in structured instructional design activities that include technology, (b) providing opportunities for pre-service teachers to observe the meaningful use of technology by K-12 teachers, (c) expecting technology to be an integral aspect of peer and field teaching experiences, (d) developing college curricula that includes both specialized technology classes and the integration of technology into methods classes, and (e) modeling authentic technology integration by collegiate professors. In addition, like other aspects of teaching, the development and refinement of TPACK requires ongoing professional learning throughout one’s career. Pre-service teachers need to develop a learning habit that they will continue throughout their lives. Technology will continue to evolve and creative music educators will find ways in which it can be used to provide students with engaging musical experiences. Currently several new and potentially transformative applications of technology are particularly intriguing. While these technologies can be found in formal educational settings, they also are being utilized by people of all ages and from all walks of life to independently and informally learn about and participate in music. Three approaches to the use of technology that have transformative potential are (a) a do-it-yourself approach to making technologies that afford various musical experiences, (b) musicking with mobile technologies, and (c) learning online. Wikipedia defines the maker movement as “a contemporary culture or subculture representing a technology-based extension of DIY culture.” It combines design, engineering, technology, and subject matter knowledge to create new devices, software, web applications, and so on. Dale Dougherty, the founder of Make magazine, likens it to “experimental play” (Dougherty, n.d.). Recently, the streaming music service Spotify partnered with the New York City schools to sponsor a Music Education Hackathon (Kamenetz, 2013). Over an intensive 48-hour period, small teams worked together to create over 40 projects designed to solve problems related to teaching and learning music. This do-it-yourself approach to engaging with and learning about music would seem to have interesting implications for persons of all backgrounds and levels of musical experience. See Martinez & Stager (2013) and view the following video to learn more about the Maker Movement. Mobile technologies – smart phones, tablet computers, iPod touches, and the like – are changing when, where, and how people engage with music. When the iPod was first introduced, one of its attributes cited was the ability to have 1000 songs in your pocket. Now, through WiFi and cellular data connections combined with cloud storage and streaming music services, a person can access nearly any recorded composition on the planet at anytime, from anyplace where they can connect to the Internet. Software applications, commonly referred to as apps, designed for these devices make it possible for anyone to learn about, create, or perform music in simple to sophisticated ways. Many of these apps are free or very inexpensive. In some ways, technologies such as this are democratizing music making, allowing people of all ages to engage in creating, performing, listening to, and learning about music, even if they have limited prior experience. To see how one music teacher has begun to implement the iPad into a traditional band program, view the video below. Finally, the Internet-powered online world is impacting the musical experiences of many people. Because of the resources available online, individuals can informally learn about all aspects of music in ways that were previously not possible. Someone living in rural America can listen to musics from around the world via Internet radio stations. Small children can creatively explore music in a game-like manner through specialized web applications. Teenagers can learn guitar by watching videos on YouTube. People of all ages can learn about music theory through interactive websites. Music teachers can engage in conversation about curriculum, pedagogy, and other aspects of music education through personal learning networks that take advantage of social media such as Facebook and Twitter (Bauer, 2010). More formalized music education is also taking place online. Webinars are being offered by professional organizations such as the National Association for Music Education. Some complete courses, including the somewhat controversial Massive Open Online Courses (MOOCs), on a variety of music topics are freely available to anyone. Opportunities for high school students to learn about music in online classes are also growing. Individual classes and complete online graduate degree programs are growing in popularity for in-service music educators. While there are affordances and constraints to any music learning situation, the challenge for the music education profession is to design online music learning experiences that provide authentic, deep understanding of music, and in the case of music teacher education programs, teaching and learning. Basic and applied research on how new and emerging technologies can be used for creating, performing, and responding to music, as well as music teacher education, is an ongoing need. Technology has influenced all aspects of society, schools, and music throughout history. Today’s digital technologies are no exception. They are facilitating new ways of learning and being musical. Utilizing these technologies in music education doesn’t mean we have to eliminate valued traditional classes, ensembles, and teaching and learning approaches. The situation doesn’t have to be either/or; it can be both/and as we maintain the best of the traditional while embracing the new. However, it is imperative that music teachers are open to and actively consider ways in which new technologies may be able to enhance and transform the traditional when appropriate, and how these technologies may provide a means to reach learners of all ages, including students who previously haven’t been involved in school music programs. Current and developing digital technologies hold the promise of a more musical culture and society, allowing everyone to learn and be active musical participants throughout their lives. For this to happen it will require the leadership of technologically proficient music educators who thoughtfully consider the role of technology in traditional and emerging ways of musical participation and expression. Bauer, W. I. (2010). Your personal learning network: Professional development on demand. Music Educators Journal, 97(2), 37-42. Bauer, W. I., Hofer, M., & Harris, J. (2012). “Grounded” technology integration using K-12 music learning activity types. Learning and Leading with Technology, 40(3), 30-32. Dorfman, J. (2008). Technology in Ohio’s school music programs: An exploratory study of teacher use and integration. Contributions to Music Education, 35, 23-46. Dougherty, D. (n.d.). The maker mindset. Retrieved from http://llk.media.mit.edu/courses/readings/maker-mindset.pdfDunphy, J. & Pinchock, G. (Eds.). (1997). Technology strategies for music education. Wyncote, PA: Technology Institute for Music Educators. Jassmann, A. E. (2004) The status of music technology in the K–12 curriculum of South Dakota public schools. Ed.D. dissertation, University of South Dakota, United States — South Dakota. Retrieved March 20, 2008, from ProQuest Digital Dissertations database. (Publication No. AAT 3127829). Koehler, M. J., & Mishra, P. (2008). Introducing TPCK. In AACTE Committee on Innovation and Technology (Ed. ), The handbook of technological pedagogical content knowledge for educators (pp. 3-29). New York, NY: Routledge/Taylor & Francis. Madsen, C. K. (Ed.). (2000). Vision 2020: The Housewright symposium on the future of music education. Reston, VA: Music Educators National Conference. Mark, M. L. & Madura, P. (2014). Contemporary music education (4th ed.). Boston: Schirmer. Martinez, S. L. & Stage, G. (2013). Invent to learn: Making tinkering, and engineering in the classroom. Torrance, CA: Constructing Modern Knowledge Press. Music Educators National Conference. (1994a). The school music program: A new vision. Reston, VA: Music Educators National Conference. Music Educators National Conference. (1994b). Opportunity-to-learn standards for music instruction: Grades preK-12. Reston, VA: Music Educators National Conference. National Education Association. (2008). Access, adequacy, and equity in education technology. Washington, D. C.: National Education Association. Ohlenbusch, G. (2001). A study of the use of technology applications by Texas music educators and the relevance to undergraduate music education curriculum. D.M.A. dissertation, Shenandoah University, United States — Virginia. Retrieved March 20, 2008, from ProQuest Digital Dissertations database. (Publication No. AAT 3010524). Reese, S. & Rimington, J. (2000). Music technology in Illinois public schools. Update: Applications of Research in Music Education, 18(2), 27-32. Rudolph, T. (2004). Teaching music with technology. Chicago: GIA.Shulman, L. S. (1986). Those who understand: Knowledge in the growth in teaching. Educational Researcher, 15(2), 4-14. Solomon, C. (1987). Computer environments for children: A reflection on theories of learning and education. Cambridge, MA: The MIT Press. Taylor, J., & Deal, J. (2000, November). Integrating technology into the K-12 music curriculum: A national survey of music teachers. Poster session presented at the annual meeting of the Association for Technology in Music Instruction, Toronto, Canada. Thompson, A. D., & Mishra, P. (2007-2008). Breaking news: TPCK becomes TPACK! Journal of Computing in Teacher Education, 24(2), 38. Williams, B. W. (2012). The non-traditional music student in secondary schools of the United States: Engaging non-participant students in creative music activities through technology. Journal of Music, Technology, and Education, 4(2 & 3), 131-147. Williams, B. W. & Webster, P. R. (2006). Experiencing music technology (3rd ed.). Belmont, CA: Thomson Higher Education. This statement was part of The Housewright Declaration, a document that summarized the common vision for the future of music education developed and agreed upon by the participants in the Housewright Symposium, held September 23-26, 1999 at Florida State University in Tallahassee, FL. Interested readers can learn more at http://musiced.nafme.org/resources/vision-2020-the-housewright-symposium-on-the-future-of-music-education/.